They built it, and we're coming...and you can too! This Friday JPSI proudly sponsors two 16-18 senior league baseball games at the Field of Dreams in Keizer. Tickets are $5 for adults and $3 for children - an affordable family night out and a great way to support your local community. JPSI partnered with Schwan's last Thursday to bring free ice cream to the Fox Tower building. Even though the weather was a little gloomy, we had close to 300 people come out to enjoy a treat of their choice from the Schwan's truck. We met Alice Giese, who is a local Schwan's representative, and together we decided to put on this event as a way of thanking our Fox Tower friends and clients for the business and support they have given us. This was also an opportunity for our friends at Schwan's to raise awareness of their brand and goods and services they provide. Did you know that the truck will deliver your order to your office in a freezer bag that can keep the food frozen for up to 6 hours?!?!? This is a great option if you're super busy and don't have the time or energy to go to the store, decide what to get, wait in line...you know the routine! If you're interested in placing an order with Schwan's, CLICK HERE to visit their site. If you enter the code ALICEG2, you can get $5 off a $25 order or $10 off a $50 order. There is no commitment required and they also have a rewards program - so check it out! We couldn't stop at just giving away ice cream, we needed some swag giveaways too! We offered quality hats, visors, koozies, reusable cloth bags, and coffee mugs. All great items to have for Summer! We would not exist if it weren't for the support from our community and we are always looking for ways to express our gratitude and give back - so keep an eye out for us at more events! 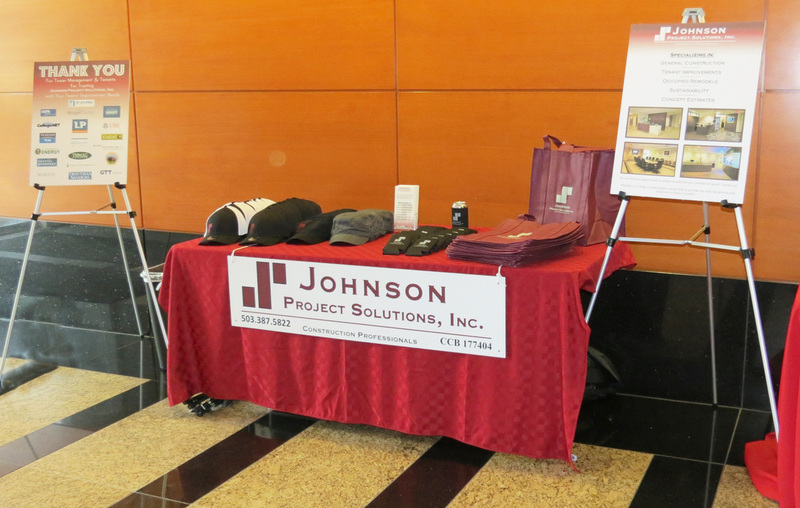 Johnson Project Solutions, Inc. (JPSI) recently sponsored the event Cash for the Cause, benefiting Candlelighters for Children with Cancer. It took place at Castaway last Thursday and we had an absolute blast! Cash for the Cause was a Johnny Cash themed Happy Hour type of event with lots of fun activities and great live entertainment! Check out the slideshow below for our photo booth shenanigans! This event ended up raising $30,000 for Candlelighters' organization and we couldn't be more thrilled to have a part in that. For those of you who aren't familiar with Candlelighters, they provide special programs and assistance to local families affected by childhood cancer. This organization is truly invaluable when you consider the impact a cancer diagnosis has on a family both emotionally and financially. Every quarter, Johnson Project Solutions, Inc. (JPSI) distributes a newsletter to our friends and partners in business. This is our way of staying connected and letting everyone know we're up to. Our newsletter for Spring 2014 is posted below.